Milk, eggs, butter... Of course! We offer so much than the basics in our dairy section. Come in and see our wide selection of cheeses, dips, yogurts, juices, and flavored creamers. 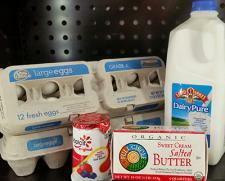 We also have a large selection of milk substitutes including soy, lactose-free milk, and almond milk. Can't find what you're looking for? Please let us know and we will try to find it for you.